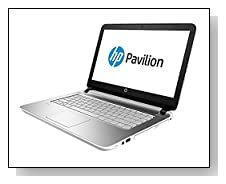 HP Touchsmart 14-V138 is a solid 14 inch compact and portable laptop with a power efficient quad core Intel Pentium processor. The item reviewed on this page is certified and refurbished by the manufacturer and comes with a 90 day warranty, is just like the original and a very well put together unit with adequate power, large amounts of memory and storage, connectivity and reliability at a rather low price. 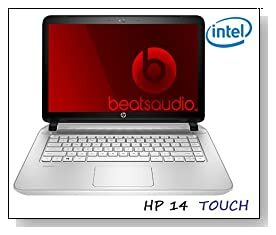 HP Touchsmart 14-V138 includes a quad core Intel Pentium N3540 processor (2MB L2 Cache) at 2.16GHz up to 2.66GHz speed with turbo boost and no hyper threading as it already functions on four cores, 8GB DDR3L SDRAM memory for the ability to multitask very smoothly and efficiently, 1TB Serial ATA hard drive at 5400rpm spindle speed for all your regular and multimedia files with HP ProtectSmart and 64-bit Windows 8.1 operating system with an upgrade to Windows 10 coming up on July 29. Thermal design power is 7.5 watts on the entire CPU and the Passmark benchmark score is 1774 as of this moment. 14 inch diagonal high definition WLED backlit touchscreen with regular 1366 x 768 pixel resolution is not Full HD and doesn’t have an IPS panel but is still pretty good and the touch function works well with the Windows 8 apps. Intel HD Bay Trail graphics will let you perform your general multimedia tasks and play older games like World of Warcraft smoothly but not really the latest games at acceptable settings. It has quite impressive HD sound through Beats Audio and dual speakers for when you’re watching videos or listening to music and HP TrueVision HD webcam with built-in digital dual array microphone that blocks the background noise as well. Horizontal brush textured linear finish HP Touchsmart is silver around palmrest and snow white on the outside, is rather compact with a 14 inch display, is less than 1 inch thin and has a solid build quality. Keyboard is user friendly and full-size, you may expect 5 to 6 hours of battery life and this will depend on the mode of use. Connectivity options include a Super Multi DVD+/-RW with Double Layer Support, an HDMI output to connect to large screens and your HDTV (even better if you have a high quality HDMI cable), 802.11 b/g/n wireless, 10/100/1000 Ethernet Lan with RJ-45 connector, Multi-Format Digital Media Card Reader, 2 x USB 3.0 ports for high speed data transfers and to connect to different computer peripherals, 1 x USB 2.0, an HDMI output and 1 x headphone/microphone jack. Apart from the touchscreen HP Imagepad supporting multi-touch gestures without on/off button also works well with Windows functions. Conclusion: HP Touchsmart 14-V138 is for those that want middle level processing power, large amounts of memory and storage, good range of connectivity and good looks with solid build quality in a light and compact package. It has unique HP features like HP CoolSense to help keep the computer cool and comfy, HP ProtectSmart to help protect your data in case of bumps or falls, Beats Audio for awesome sound quality, dual array microphone to cancel background noise and more. Judging by the customer reviews, it seems to be a very decent refurbished product and you will be getting a great discount because of being a refurb unit. There is no numeric keypad on this computer due to being compact but I personally prefer keyboards without numpad after having used one for over a year, going back to numpad type keyboards really does feel awkward. Pentium N3540 is a quad core CPU that is designed to be energy efficient (much better than previous Intel Atom’s) with middle of the road power that is good for daily tasks and a bit more but not the very advanced multimedia or software (Passmark benchmark score is 1774 at the time of this review). Definitely a good buy especially for the low price level.